A UH-1Y Huey Venom helicopter. File photo courtesy of U.S. Marine Corps. MARINE CORPS BASE HAWAII – On Dec. 5, 2017, a UH-1Y Huey helicopter aircrew with Marine Aircraft Group 24, 1st Marine Aircraft Wing, was involved in a lasing incident while flying routine operations near Marine Corps Training Area Bellows. The incident has been reported to the Honolulu Police Department. Naval Criminal Investigative Service (NCIS) along with the Federal Bureau of Investigation (FBI) are actively investigating this crime. 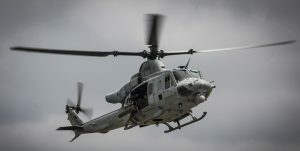 They, along with Marine Corps Base Hawaii (MCBH), will work with the HPD during the investigation to ensure the safety of military personnel, the aircraft, and the Waimanalo community. Laser aiming at an aircraft is a federal crime. Violators can be charged with up to five years in prison and a $250,000 fine. Additionally, you are subject to an $11,000 civil penalty. If you have information about a lasing incident or see someone pointing a laser at an aircraft, call the Honolulu Police Department by dialing 911 or report it by email to the Federal Aviation Administration through laserreports@faa.gov. You may also text NCIS and your tip information to CRIMES (274637). Laser illuminations can distract, disorient and debilitate a pilot. An event occurring during a critical phase of flight, such as landing, can lead to catastrophic results if the pilot cannot see instruments to remain on course or maneuver in a heavy traffic environment. Lasing a member of the aircrew will have adverse physiological effects to include visual pain and loss of depth perception.